Dark and sinuous feline shapes appear to form out of the night’s darkness. The creatures are little more than ghostly strands of darkness, pitch black, with glowing eyes and living of spectral white fire. Behind each beast’s savage visage glimmers an ancient and evil intelligence. Space 10 ft.; Reach 5ft. Cursed by the Gods A nightking is eternally trapped in its lion’s form and can’t be affected by any polymorph spell. It can speak, but is voice is feral and inhuman. It can’t enter any temple or area consecrated with spells like hallow (a nightking can’t attempt to dispel such kind of magic, but can order its followers to do so). Damage Reduction This entry requires extra explanation. A nightking’s DR can only be ignored by good-aligned weapons inside an area of natural daylight (or the daylight similar spells). Grant Unholy Benediction (Su) A nightking can grant a special atonement to a fallen priest by “blessing” her holy symbol. As long as the ex-priest follows the specific nightking’s commands and has the symbol with her, she has full access to all her class abilities, with the exception of her domains. The ex-cleric now has access only to the Darkness and Destruction domains. Each nightking can keep just one ex-priest empowered and can remove this gift at any time (as full round action). The nightking always knows the locations of his ex-cleric servant. Shadow Body (Su) A nightking exudes raw darkness from its corrupted body, dropping the illumination level in an area of 20-ft. radius by one step. A nightking also gets total concealment even in dim light setting. See in Darkness (Su) A nightking can see even in areas of deeper darkness. Spells Each nightking cast spells and channel negative energy as a cleric of 10th level. Succor from Death (Su) A nightking is healed by negative energy and wounded by positive energy. Each nightking also generates constantly a 20-ft. aura of negative energy similar to the death kneel spell (DC 20). The so called Nightkings are spirits of darkness and profanity that take the form of sinister lions made of shadows and white fire. Once they were old archpriests and heads of the holy orders of the Crimson Savannahs’ cities. Nevertheless it came to pass that the priests were seduced by the promise of true immortality found within an ancient scroll – a Ritual whose degraded form is known today as the Path of Lichdom. The ritual required a massive sacrifice of believers and the Seven were thwarted before completing the ceremony. Cursed by the gods, the Seven are trapped in bestial forms, bound to the Savannah, unable to leave and barred from walking on holy ground. Burning with eternal hatred for the gods, the Seven seek to find the one special ex-priest. This dark messiah will destroy the holy orders of the Crimson Savannahs in a bloody and savage war. To achieve that they attack caravans with holy items and steal relics, seeking to weaken the cults. The Nightkings also guide as false gods the barbarous races of the savannahs and serve as patrons to brigands and reavers. Such groups are usually led by ex-priests “touched” by the Seven. Many question the gods’ wisdom in cursing the Seven, for they are today a threat perhaps as greater than during the time of the Ritual. A few sages and heretics claims (far from the ears of the holy orders) that prophecy surrounding the Dark Messiah is older than the Seven’s curse; that the olds actually want that the Nightkings find their nemesis for them. If true, it’s a dangerous game for the people of the Crimson Savannah. In case any of you’re wondering, the inspiration for these monsters came from the movie The Ghost and the Darkness. I'm (once more) away from (my second) home. Thus, until I can have access again to my personal notes and books, I thought about posting some of the house rules that I'm using in my Pathfinder campaign . 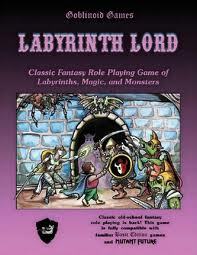 These rules try to reflect a heroic and high-fantasy style of game. Please, bear in mind that game balance is not one of my concerns. Other commentaries follow some house rules. Hit Points: At 1st level you acquire your full Hit Dice as bonus hit points. For example: a fighter gains 10 extra hit points. Feat and Ability Score Increases: All player characters gain one feat at every level. There aren't Ability Score increases due to leveling, but you can spend a feat to add +1 to one Ability Score. All Player Character receives +1 to all Ability Scores at 10th level and 20th level. The idea here is to increase versatility. Favored Class: For every 5 levels in your favored class you gain a bonus feat. This one was stolen from Conan d20. Iterative Attacks rules from Trailblazer. Basically this means that all characters can opt to make two attacks at 6th level, each with a –2 penalty. This penalty decreases at higher levels. I will try to do a Trailblazer review next week. It really is a terrific sourcebook. Staggered Condition: Your Character acquires this condition when his Nonlethal Damage reaches 75% of his current Hit Points. This rules was created to widen the narrow margin of the staggered condition and to encourage the use of knockout attacks; unfortunately it requires a little more math from the players. Disable Condition: Your Character remains disable and doesn't fall unconscious and dying if his negative Hit Points are equal or higher than his Constitution modifier . Example: an elf with Con 15 (+2) would be disabled at 0, –1 and –2 hit points. A great rule from Monte Cook's Arcana Evolved. Death: Your Character only dies when he hits a number of negative hit points equal to 10 + your Constitution Score. For example: a dwarf with 18 of Con only dies at -28 hit points. There is a wonderful variant for D&D 3.5 of the 4th Edition's death rules that I'm tempted to use in my next Pathfinder campaign***. Cleave Feat: I use the 3.5 version. Never got used to the Pathfinder's one. We house ruled Great Cleave in a way that you also gain an extra attack if you deal massive damage or confirm a critical threat. Endurance Feat: The normal benefits of the feat, plus the Character may sleep in any armor which he is proficient without becoming fatigued. Also, while fatigued, he suffers just –1 penalty to Strength and Dexterity. When exhausted, he suffers –4 penalty to Strength and Dexterity. Mounted Combat: You gain a +3 bonus to attack (+1 from higher ground, +2 from combat advantage, almost like flanking). You gain +5 ft. reach to your weapon and, if you move more than 10 ft. before attacking, you can substitute your Strength modifier to damage for your mount's Strength modifier. This rule was a friend's suggestion and I used it because we both love mounted combat and the historical tactical advantages linked to such fighting style. Gang Up Bonus: Inspired again in Conan d20. Every attacker after the first gains a +1 cumulative bonus to attack one target at the same round (maximum +4). This rules make mobs of lesser monsters like goblinoids scarier. Psionic Powers and Spell’s Base DC: I use 10 + ½ caster level + key ability score modifier as an universal DC. The Heighten Spell feat is removed. I took this rule from Green Ronin's outstanding Skulls & Bones. And I like to empower my casters. Improved Spells & Powers Damage: All dice damage derived from spells, psionic power, spell-like abilities and such are improved by one step. For example: fireballs deals d8s. As I said, I'm not concerned with balance and I really like powerful spellcasters. I also like to create social and weird mystical limitations to make may casters more unique in my settings. Therefore, this rule is something very personal and I really can't recommend it for everyone, as it requires a lot of ad hoc judgment. For example, I don't use it for effects that add damage to melee or ranged attacks. Spells and powers with fixed amounts of damage may require some change also. Until now, my players have enjoyed it. Spell Mastery Feat: Your Character can also cast these spells spontaneously, but he must “burn” another slot of the same level to do it. Simplified Format for Monsters: I'm still using this method at middle and high-levels to customize my lesser monsters and NPCs, specially when I have little preparation time for my games. It is far from perfect but it's working so far. There are other rules, but those above are my favorite and I'll probably keep using them in other campaigns. Finally, I also use some very particular rules for Action Points (based at first on Unearthed Arcana) and Hero Points (this based on Monte Cook's Arcana Evolved), but I'll leave those for another time. *** Check this link for those cool "death and dying" rules I mentioned. …but that doesn’t stop me from tinkering with the rules. I love to make house rules and little experiments with RPG systems almost as I love reading them. Ok, the idea here is to give spellcasters a little more room to maneuver. While I enjoy Philotomy’s house rule about lesser "special effects", I think my novice players will find it a little confusing at first – and that will probably derail the game. I was thinking actually about Spellcraft & Swordplay’s casting system. Spellcraft & Swordplay is not exactly a retro-clone, but one of its purposes is to present an accessible system based on the old Chainmail rules. The main difference is that d20s get ditch off, replaced by 2d6s. One of the innovations of S&S is its magic system. Spellcasting here is not an automatic action and requires a check do determine if the spell is casted immediately, delayed one round or simply fails – and it is then forgotten. The higher the spell level, the more complex it is – and higher it is the check’s difficulty. I really like the fact that a caster only forgets a spell after failing a roll. This radically changes spellcaster dynamics, but I believe that’s an element some players might enjoy. Well, this blog is mostly about Pathfinder, but if there are other Old School players out there: what do you think? Have you attempted something like that? I'm finally running Swords & Wizardry! After three game sessions I’m proud to say that my cousin and his friends are officially into the hobby. One of them even told me that he’ll pick not only a copy of Swords & Wizardry (in portuguese) but also buy a second game and asked for my opinion – I humbly suggested Dragon Age, whose portuguese edition is really well done (and, damnit, its a box!). 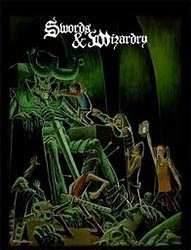 Well, Swords & Wizardry did it again for me. I’ve being reading again and again this excellent restructuration of “The World Greatest RPG” for a little over a year now. I was eager to run it to my old gaming group – at the time I was aiming for a very lethal and traditional dungeon-crawl. With my recent move to a new city, my plans were completely frustrated and I believed it would take months to run another game. Today we played twice. I built a little dungeon, thrown their characters inside as prisoners of the “Wizard of the Rock” and let mayhem ensue. Their first attempt to flee didn’t work out, in part because they tried to kill everything that crossed in their path. They also mistreated and abused the only neutral NPC their found. After being killed by a huge rat and her spawn – in a trap set by a disguised wererat – they built new “prisoners” and attempt a second escape. This time they took things more carefully, allying with other NPC prisoners and going slowly from room-to-room. They accumulated quite some loot in treasure and weapons, but ended seduced by the random mystical effects of the wizard’s magic pool – their last ally was polymorphed into a rat while the party’s magic-user, after enjoying a haste effect, tasted a second drop from the pool and followed the NPC through the wall’s slit. The last two members of the party were, respectively, killed by an animated owlbear carpet and caught as a slave by a group of half-orcs. And again, even after these slaughters, they really loved the game and are already asking for a continuation (my cousin even bought some dices for him). During these games, I’ve tried to get used to the S&W feel and dynamic, specially its lethality. I’ve being tempted to employ some house rules to amend that, but after some thought I think I’ll continue to run it as written. The players are getting smarter with each session and I’m confident that I can create a campaign out of their next games. Here goes my second advanced maneuver for Pathfinder, please check my first article where I briefly explains the ideas behind these "exotic" fighter techniques. As a side note, if you are using this advanced maneuver, you may want to remove the Bodyguard feat (from the Advanced Player’s Guide) from your game. Another option is to leave it as an alternative for non-fighter characters. Prerequisites: Combat Reflexes, fighter level 2nd. Benefit: You acquire the guard combat maneuver. Prerequisites: Combat Expertise, advanced combat maneuver [guard]. Benefit: You receive a +2 bonus on your guard maneuver checks. You gain an extra attack of opportunity each round that can only be used to guard someone. Prerequisites: Improved guard, fighter level 6th. Benefit: You gain a second extra attack of opportunity each round that can only be used to guard someone. You also can use guard maneuvers against ray attacks. Finally, you can attempt a guard maneuver even if you’re flat-footed and unaware of the attack, but you suffer a –8 penalty to your CMB roll. When an adjacent ally is attacked by a melee or ranged attack that you are aware, you can use one of your attacks of opportunity to make an opposed CMB roll*. If you have a shield while attempting a guard maneuver, you can substitute your weapon’s bonus to hit for your shield’s AC bonus on the CMB roll. If your roll is greater than the attackers, the opponent’s attack is directed against you instead of your ally. Check if he rolled high enough to hit you. If so, you suffer all the attack’s normal effects. Each time you execute a guard maneuver you expend one of your attacks of opportunity of that round. *By the official Pathfinder rules there aren’t opposed CMB checks, but in the guard maneuver case I believed it makes more sense – after all you’re not attempting to hit your enemy but to block his attack. If this exception bothers you, please by all means keep the traditional Combat Maneuver system and roll the fighter’s CMB against the opponent’s CMD. Even taking into account that I’m a little rusted with D&D 4th Edition (a topic I intent to elaborate on another post), Courts of the Shadow Fey quickly picked my interest due to its theme. I find that few adventures really bring up fey creatures as portrayed in my favorite legends – dark, mischievous and totally heartless. Tales of the Old Margreve managed to hit right on the spot and Courts is another fine example. Visually speaking, Courts of the Shadow Fey has a beautiful and poetic layout with its light purple background and vine/rose motif. The choice of Stephanie Law for the cover art was also perfect. The inner art is B&W but unfortunately fails most of the time to evoke the cover’s feeric mood. The adventure’s story start with the change of seasons at the Shadow Fey Courts, when the new ruler discovers that those nonsensical humans of the Free-City of Zobeck have broken an old contract by overthrowing their tyrannical and fey-aligned nobles some 80 years ago. By the pact’s terms, the City should now belong “rightfully” to the Shadow Courts. Through the scenario’s development, the fey begin literally to take over Zobeck and cover the city with strange and deadly laws. 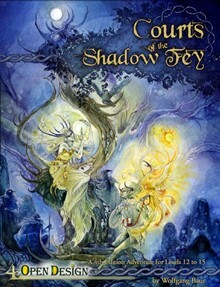 To my surprise, Courts of the Shadow Fey is not bound to a specific chain of events. The entire adventure is actually a group of encounter and sub-scenarios, in an almost sandbox style, especially at the story’s end. The first part of the adventure is the only obligatory (and it also is the only in need of a more firm hook for the players character, who are after all paragon-level, not wandering no-ones). The strange effects that the shadow fey provoke over Zobeck are probably one of the scenario’s most interesting parts and sometimes it’s a shame that they’re dropped just as small inspirations for the DMs. A good portion of the combat encounters have enemies with equally disturbing effects, most dealing with shadows, illusions and duplications. The growing weirdness as the mortal and fey realms come together makes for a terrific scenario. 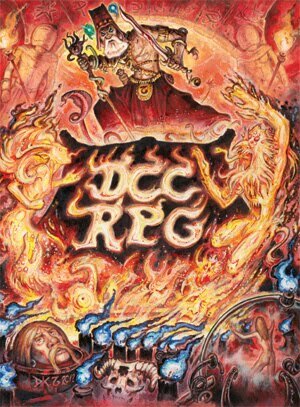 I can’t stress enough how I’m impressed by the author’s dedication to keep a strong feeric atmosphere through the entire adventure, not just in terms of rules but also on narrative advices – a good example being the reception that the player characters receive at the entrance of the Courts in the Shadow Realm. But speaking of rules, we have even a new mechanic to reflect the party’s status inside the byzantine nobility of the fey (and also some material to help the DM, like a handy selection of random tables to reflect the ever changing members of the Courts). Another nice touch of Courts of the Shadow Fey is that it provides optional statistics for its foes, reducing slightly their hit points total, while increasing the damage. 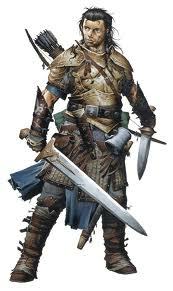 Through the story’s advance there is also a fair number of examples and suggestions on the use of skills and rituals, all without forcing skill challenges for every single non-combat encounter (a trait that in my opinion tend to disrupt roleplay and that is annoying in many 4E adventures). The authors also show a good combination between theme and encounter design, especially when the party reaches the otherworldly domains of the Shadow Courts. Courts of the Shadow Fey is not a traditional 4th Edition adventure. This is a complex scenario that will challenge even veteran groups in ways they never imagined. In fact, I never expected to see such social and intrigue heavy adventure for a game famous for its tactical combat rules. The guys at Wizards of the Coast could learn a thing or two about adventure design with this dark beauty. These two feats are a little more complex and I’m still not sure about the second one's power and balance. The first was inspired by Monte Cook’s unified magic system of Arcane Unearthed (or Arcana Evolved); the second is another attempt to simulate something I read in novels. Actually – about Casting Focus – I originally wanted to tie it to the Arcane Bond (object) class feature of the Wizard but, after some thought, I believe that that wouldn’t be fair to the other spellcasting classes. Maybe I can come up with something more specific to the Arcane Bond feature (I have my house rules for it, time to recheck them I guess). You are able to compartmentalize your mind through physical objects, enabling the preparation of more spells. Benefit: You can use one slot to prepare multiple spells. The only limitation is that the total of prepared spell levels must be equal or lesser to the chosen slot level. For example: if you choose a 4th level slot, you can use it to prepare two 2nd level spells or one 3rd level spell and one 1st level spell. Each of these spells must be tied to a unique focus. These foci are tiny non-magical objects, like a ring, a coin or even just a twig. Each focus is added to the components of that specific spell (even if you have the Eschew Materials feat). You can only have one spell slot divided each time. Special: If your DM allows, even spontaneous casters can use this feat, but they must prepare all spells derived from a divided slot like a non-spontaneous caster. You can use a special mystical object to cast your spells in a more simple and potent way. Prerequisite: Any two metamagic feats, non-spontaneous caster. Benefit: Choose one common non-magical object, like a staff or a ring, to be the temporary recipient of a spell. That object becomes your casting focus, an additional spell component. After preparing the spell, the casting focus begins to irradiate a faint magic aura (of the same school of the prepared spell). If your casting focus is broken (link) or destroyed before you can cast the chosen dweomer you suffer 1d6 points of nonlethal damage per spell level. If your casting focus is stolen, it can be used by an enemy spellcaster against you. Any spell cast by him against you, while holding the stolen focus, imposes upon you a –2 penalty on saving throws and caster level checks (to counterspell). The stolen casting focus can be undone by its creator the next time he stops prepare his daily spells. A spell prepared through a casting focus gains the benefits of one or two metamagic feats possessed by the caster without increasing the spell slot. There are only two limitations. First, these metamagic feats can’t increase a spell level by higher the +2. Second, the caster can have only one spell stored in a casting focus. Following these rules a caster could prepare a silenced, stilled spell through a casting focus; or even a heightened spell (as if using a slot 2 levels higher). Yesterday I ran Swords & Wizardry for the first time. It was a very short session, improvised on the spot, the result of my cousin’s curiosity about table-top RPGs. He saw me reading the core book and asked about it. After a bit of explanation, I encouraged him to build a 1st level Fighter – the brave and liar “Sir” Philippines. I described to him a small town taken by a group of brigands. After facing a trio of those bandits, my cousin decided that he didn’t wanted to be a hero, and took off to the local woods where, while searching for a shelter to spend the night, he was caught by a pair of hungry wolves and died a totally non-heroic death. I was astonished by the game’s lethality, but more so by my cousin’s reaction: he loved it! Even his character's death seamed funny to him, because he said to me that it was his choice to go into the woods. He even asked, later, about the town and the bandits. I hope I can hook him up for another game soon. Ok, this feat is not exactly "weird". I added the Skill Focus requirement as a kind of counterbalance to the feat's benefit (the same can be said about the limited uses per day). This feat is another attempt to simulate some of the tropes of fantasy and sword & sorcery fiction (without making the caster wait for spell turning and other similar high-level spells). You can concentrate on a more powerful counterspell that lashes the dweomer’s energy against its original caster. Benefit: If your counterspelling is successful, the original caster suffers 1d6 points of damage per slot level of the countered spell. For example: a countered fireball would provoke 3d6 points of damage, while a maximized fireball would cause 6d6 points of damage. This damage ignore SR and there is no saving throw. Eldritch Refusal can be used once per day, plus one more time for each 4 levels in spellcasting classes. You must declare the use of this feat before the counterspelling is resolved. The unified Combat Maneuvers mechanic is probably one of the best innovations of Pathfinder (if you haven’t seen it yet, here it is). This post was inspired by the new maneuvers from the Advanced Player’s Guide and has 2 basic goals: give more options to the fighter class, without changing its mechanics (I have an alternate fighter class, but let’s leave that for another day…); and strength the fighter’s niche. These rules are constructed around a new type of combat feat that opens a new and exclusive combat maneuver (you can think of them as “Exotic Maneuvers”). Only characters with the specific feat can choose to use these specific maneuvers. These feats are exclusive to the fighter class. Prerequisites: Combat Reflexes, Combat Expertise, fighter level 4th. Benefit: You acquire the hold combat maneuver. Prerequisites: Combat Expertise, advanced combat maneuver [hold]. Benefit: You receive a +2 bonus on checks made to attempt a hold. You also receive a +2 bonus to your Combat Maneuver Defense when an opponent tries to hold you. Prerequisites: Improved hold, fighter level 8th. Benefit: Whenever you successfully establish a hold, the penalty lasts for 1d4 rounds, plus 1 round for every 5 by which your attack exceeds the target’s CMD. In addition, you receive a +2 bonus to your Combat Maneuver Defense when an opponent tries end from your hold. You draw an adjacent foe to a closer-fighting style, disturbing his attempts to move or attack other adversaries. This maneuver requires a standard action that does not provoke an attack of opportunity. If your attack is successful, the target is hold by your fighting stance and provokes an attack of opportunity if he attack any target other than you or if he moves, even if it is just a 5-feet step. This hold remains in effect for 1 round. For every 5 by which your attack exceeds your opponent’s CMD, the penalty lasts 1 additional round. The target can end a hold with a standard action and successful CMB roll. If you possess the Greater Hold feat, the penalty lasts for 1d4 rounds, plus 1 round for every 5 by which your attack exceeds your opponent’s CMD. In addition, you receive a +2 bonus to your CMD against any attempt to end the hold. Ok, last week was probably the most chaotic of my life. In just three days I had to move to another city because of a job offer, leaving behind my old-time players, my Cthulhu Dark Ages mini-campaign and my 3-years old Pathfinder game. I still hope I can keep the Pathfinder campaign running, maybe twice or thrice per year (or maybe I should check the Obsidian Portal for some online tools). Now, my shameful confession: I had to leave my parent’s home in a hurry, so that means leaving my hoard of books and games behind. But, being an RPG addict, I couldn’t resist taking something with me (after all, I know a few gamers around here and some of my cousins may want to try a game or two). What games did I bring? 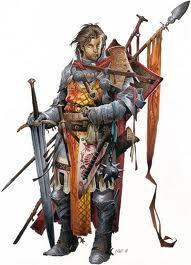 I'll keep posting the Pathfinder material and musings from my campaign. P.S. : Mandy, miss you a lot, girl! Kobold Quarterly #16 is out! In this issue we finally have the official announcement of the Midgard Campaign Setting. Also from world of Zobeck, there’s an article on the ecology of the gearforged. After Eberron, mechanical races were a kind of hit, but I still find the geargorfed the most interesting application of the concept, in part due to the fact that they we created using humanoid souls, each one with memories and backgrounds from their previous life. The next article also details more of the Free-City by describing its courtesans and their sinister abilities and origins, followed by variant bard abilities, feats, spells and new items. For the 4th Edition, the Royal Order of the Golden Fox is an ancestral order of hunter from a falling kingdom of the Wasted West. Finally, the issue’s last article expands the Free-City by detailing its armies and uneasy neighbors. For Pathfinder we have a group of new magic items Paizo’s RPG Superstar 2010, a new prestige class – the clockwork adept –; two adventures; an article about animated objects and another about sanctuaries. The magic items are probably the best part, with really original and fun arcane paraphernalia like Batrachian Helm (tongue included!) and the Cacophonous Monkey. If any of these items were just a little more dangerous, we surely would have an authentic “old school” vibe article. The prestige class is your typical specialized spellcaster, with a good benchmark ability at 10th level (the construction of a clockwork body to house the caster’s spirit if slain) but with some design decisions that I found unnecessary – like creating a new Knowledge skill category. 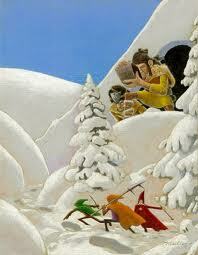 The first mini-adventure – The Curse of the Blue Titchyboo – deals with stolen goods and a tengu school. The second – Beer Run! – is based on the Frozen Empire’s patronage project (which is strangely missing from Open Design's site). The animated objects article bring a lot of new construct traits, drawbacks and a new spell – quite useful and entertaining for such limited topic. The material about sanctuaries follows the same vein, broadening the concept of the sanctuary spell to encompass entire areas (like temples and holy grounds), with some great ideas like the roads of peace. For the 4th Edition, the potion miscibility rules are definitely my favorite, bringing back some mayhem and fun to the game; while the next article has powers specific to minion-role enemies. Also an enjoyable reading, we have an article on hit location rules to spice encounters with monsters (like the classical Lernaean Hydra). Finally, there’s an article with new powers to convert your typical critter to a clockwork (or steampunk) version. We have an informal interview with famous game designer Robin D. Laws, where he talks about Ashen Stars, his newest game, and the Pathfinder novel Worldwound Gambit. In Monte Cook’s short article we have an example of how to play outside a game’s rule and have a good item with it (albeit Monte’s example really steps over the metagame/disbelief line of things to my tastes). 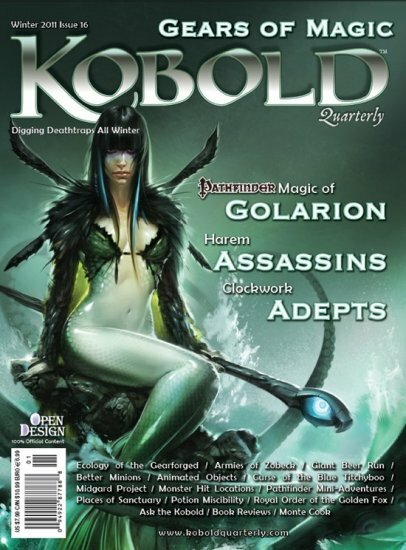 Kobold Quarterly keep its position as the best d20 magazine in the market. A more than worthy heir to the classic (printed) DRAGON Magazine. The Midgard setting is already taking it fair share of the quarterly’s content and this issue has probably the most interesting 4th Edition articles to date. 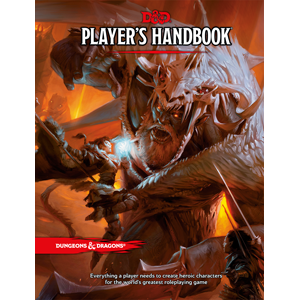 The Pathfinder pages on magic items, animated objects and sanctuary are also fine additions to any table. A few years ago I did a cinematic short campaign for Legend of the Five Rings, inspired in oriental action movies like Zatoichi and animes like the silly (but amazingly fun) Ninja Scroll. I remember using a house rule to reflect my minions mob that surrounded some of the main villains. In game terms those worthless servants were translated just as extra Wounds (L5R is a pretty lethal game). My players at the time loved the flavor of the rule – and the over-the-top battle scenes that it generated. My Pathfinder campaign is now reaching the level 12 and I’m tempted to use a similar approach with minions to represent my evil high-priests’ and warlocks’ acolytes or guards. Actually, I think this idea may work better at Pathfinder, because Hit Points are already a very abstract mechanic. So… how to do it? 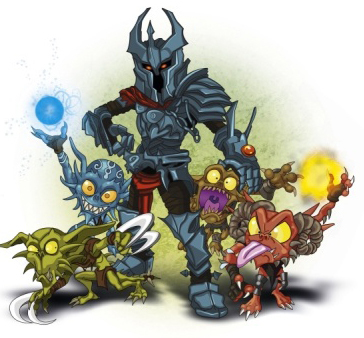 Creatures with the minions mob template are surrounded by a group of lesser servants and defenders. Usually this mob occupies a 5-feet deep zone all around the creature. Quick Rules: +1d6 damage, once per round, to all enemies adjacent to the creature; +20 hp for each 5HD, until these extra hit points are gone the creature can only be directly attacked with reach weapons and is considered to be protected by a soft cover (Pathfinder Core Rulebook p. 196 or here). These extra hit points constitute a separate pool of hit points and doesn’t share any kind of DR with the creature. Rebuild Rules: +2 on all rolls (representing help from the minions); the minions deal damage as a swarm (use the creature’s HD to determine damage); +8 hp/HD or +20 hp – whichever is higher; immunity to flanking, critical hits and can only be attacked with reach weapons; the creature has soft cover (Pathfinder Core Rulebook p. 196 or here) and its sacrificing minions allow it to ignore area attacks as if it processed the improved evasion class ability. These extra hit points constitute a separate pool and doesn’t share any kind of DR with the creature. All the special abilities above are lost as soon as this extra pool of hit points is gone. Wolfgang Baur's Home Campaign is coming!